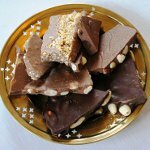 The National Bittersweet Chocolate with Almonds Day is annually observed on November 7. It celebrates a very particular combination of flavors – dark chocolate and toasted almonds. Both bittersweet chocolate and almonds are known to have health benefits. Bittersweet chocolate is a type of dark chocolate. Dark chocolate consists of chocolate liquor (pure cocoa mass), fat, and sugar. It contains very little milk or no milk at all. Dark chocolate varieties differ in sugar content. Semisweet chocolate contains half as much sugar as cocoa while sugar percentage in bittersweet sugar is not higher than 33%. Almonds are edible seeds of the almond tree. They are referred to as nuts although they are not true nuts from a botanical point of view. However, almonds are nuts in the culinary sense. Almonds have a distinctive flavor and are widely used in many sweets and desserts, including but not limited to nougat, marzipan, macarons, financiers, jesuites. The combination of chocolate and almonds has been known since at least mid-18th century; Eliza Smith's cookbook The Compleat Housewife contained the chocolate almonds recipe. Bittersweet chocolate goes really well with almonds as its bitterness accentuates their flavor.